I’m lucky enough to have in-laws that live in Myrtle Beach, South Carolina. Every so often, we get to head south to a nice house just a few minutes away from one of the most beautiful beaches in the world. 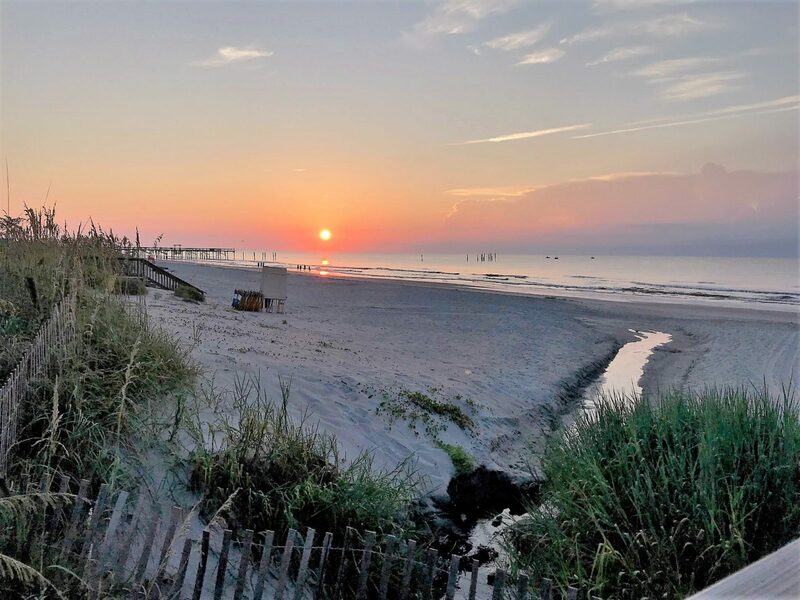 This year, because of swim team, our kids are used to waking up early and heading out, so for the first time, we brought the children to watch the sunrise over the ocean. I have no words capable of describing the beauty of an ocean sunrise. The long, empty stretch of sand, the translucent water swishing around our toes, the stretch of hot pink sky fading to soft purple and then the gray-blue of early morning. As I stood with my toes dug deep in the sand, facing the soft breeze off the ocean, hymns of praise welled up in my soul. Throughout the rest of our time at the beach, I marveled at the wonders of ocean life. I mean, I’m a homeschool mom. Do you know how many books about the ocean I’ve read to my kids? Hundreds, if not thousands. But seeing the ocean firsthand is so much more impressive than any book or YouTube video. So life lesson #1? The ocean really does teem with life. I can’t remember where I heard it or read it, but the phrase “The ocean teems with life” was on repeat in my head all week. Every wave that came by was filled with dozens of little fish. The kids (and maybe me, too) tried so hard to catch one, but those little guys are fast! We couldn’t even get our hands close to them. The whole shore was dotted with the breathing holes of hermit crabs and the skeletons of the not-so-lucky ones. 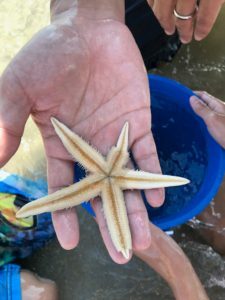 At one point, I sat down next to my son, put my hands down in the sand, and pulled up a starfish! We were all so excited. The kids filled up a bucket with sea water to keep it safe while I ran to get my camera. We took several pictures and showed it off to a few other families before my husband placed it back into the ocean. Shells, both whole and broken, littered the sand. 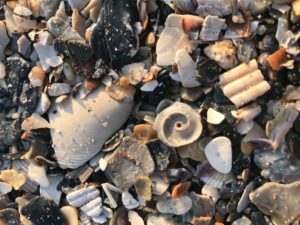 I loved searching through them, hoping to find a rare conch shell or a sand dollar, but also delighting in the small ones and the tiny pieces, rough on one side and pearlescent on the other. Truly, God’s creation is marvelous, and it is so much broader then we can ever imagine. Why did God make so many kinds of fish? So many kinds of crustaceans? Wouldn’t one of each be enough to show His glory? God is many-splendored, and our human minds can never understand His greatness. The variety of His creation is only a tiny reflection of His glory, even though to us the mere earthly splendor of the ocean is enough to take our breath away. Just imagine what Heaven will be like when we, at last, can finally see Him in His full glory. Life lesson #2: Life is hard, and we can get crushed. While the ocean is beautiful, it is wild and untamed. Fierce and powerful. Greedy and unrelenting. Ocean waves are fun to jump over or to ride on a body board, but if you don’t pay attention, even a mild wave can smack you down. Most of the waves were small this week, but at one point, a large one came up and I scooped up my two children next to me to protect them. I saved them from a dunking, but the powerful water snatched my sunglasses off my head and no matter how hard I looked, I never found them. Worse things than that exist at the ocean, though. Dangerous rip tides hide in shallow water. Stinging jellyfish float nearby. Other wild animals lurk beneath the waters as well. 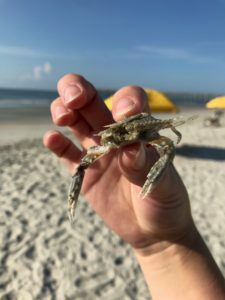 A small crab pinched my daughter’s toe and terrified her, and a few hours later, the lifeguards made everyone get out because of a shark sighting, and all the kids were really scared. Storms sink ships and drown people. Tsunamis and hurricanes flood land and destroy property and take human life. A walk along the beach shows death as well as life. Skeletons of crabs, pieces of dead fish, broken shells that once housed living creatures. 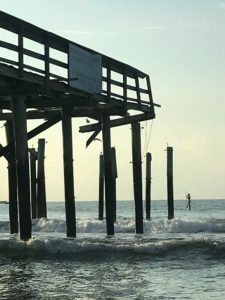 Even the pier in the middle of the beach here is a testament to the power of the ocean’s storms. The end comes unexpectedly soon, just over the edge of the water. Birds perch on wooden posts that once held the rest of the pier before hurricane winds and waves destroyed it. Death comes unexpectedly, as well. All of us will die. Some of us suddenly in an accident or by violence. Some of us over a long, dragged-out period of dying inch by inch. Some of us peacefully in our own beds by simple old age. Just as we have no power over ocean waves, we have no power over death. It comes when God wills it. All we can do is be ready. Face those dark thoughts about death and eternity and make our peace with God through His Son, Jesus Christ. God longs to welcome us into His family, to love us as His children. In fact, He faced death Himself, so that we won’t have to face it alone. If you don’t know Him personally, please seek Him. Read the book of John, especially chapter 3, where God pours out His heart of love for us. All you have to do is confess your sin and believe in His forgiveness. Accept the gift He offers you freely. Don’t live your life afraid of death. Life lesson #3: Beauty can be found in brokenness. The churning waves of the ocean crush sea shells every time they hit the shore. In fact, the very sand we walk on at the beach is mostly made up of tiny bits of shells pulverized by the power of the sea. When I searched for treasure to take home from our vacation, I really wanted to find a variety of intact shells to display. You know what? It’s hard to find whole shells! Most of them are at least split in half and many are merely fragments of what they once were. 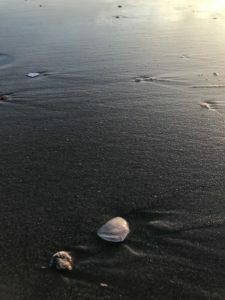 As my husband and I strolled along the sand, we came to an enormous pile of sea shells. Surprised, we paused and examined it. I joked and called it a ‘mass grave for sea shells’, but really, that’s what it was. But as I searched through it, I didn’t see just useless, broken dead things. I found beauty. Each fragment held a bit of its own beauty, highlighted by being a separate piece. The intricate swirl of a large shell can be missed, but if the swirl is seen alone, its beauty is appreciated. Life breaks us. Not one of us will make through an entire lifetime unscathed. We face the unimaginable. The death of a loved one. The betrayal of a spouse. The insecurity of financial ruin. Our healthy body aging and bringing pain, disease, and weakness. How can we survive such things? We can’t. Not truly. We break, and change, and grow. Who I am now is not the same person I was ten years ago, or even five years ago. God uses the hard times to make us seek Him. To teach us what we need to do. To sand off our rough edges. The process is painful, but we can trust the One in charge. He made us. He cares for us enough to do the hard things and guide us through the lessons we need. And if we trust Him and follow Him, at the end, we will see the beauty He creates through our brokenness, just as we see the beauty in the broken shells on the beach. Lovely post! One of my favorite aspects of time spent in nature is how it draws us to our Creator. 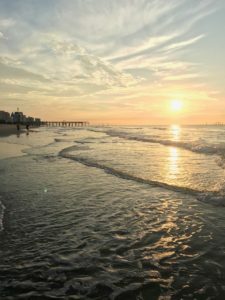 What beautiful truths to be gleaned from a family trip to the beach! We really do serve an amazing God.